This famous Walt Disney quote is the first thing that appears on screen in Emanuel Hoss-Desmarais’ eccentric, funny-ish comedy “Birthmarked.” Disney’s words are immediately followed by the wintery image of a rural family of five, which comes into view like an awkward, DIY Christmas card, with parents and siblings standing on snowy grounds in front of a charming lake cottage. We detect a doze of comedic tension in the air right from the start and slowly recognize that the unease among family members is caused by something more than the daily pressures of parenthood and ordinary sibling-to-sibling enmity. What the title of the film doesn’t completely achieve, the Disney saying does: it subtly spells out the themes of Desmarais’ film before its adequately amusing humor (through a script penned by Marc Tulin) introduces the viewer to the younger selves of the now-parents Catherine (Toni Collette) and Ben (Matthew Goode). Both coming from a long line of prestigious scientists, the two high-IQed scholars meet in graduate school and prove to make a perfect match in the lab as well as the bedroom. Allured by the idea of proving the ultimate power of “nurture” over “nature,” the pair decides to raise an unusual family, infusing their children with the necessary tools and knowledge to challenge their genetic predispositions. Can you really grow up to be something you’re not born as? Catherine and Ben quit their jobs and jointly elect a life dedicated to proving that no one has to be obstructed or defined by their lineage. Enter the eccentric millionaire/scientist Gertz (Michael Smiley), who agrees to fund the research project for his own set of mysterious scientific goals. Soon enough, Catherine and Ben (expecting a baby) move to the countryside with their Russian research assistant Samsonov (Andreas Apergis), and adopt two kids, whom they’d raise alongside their own biological son Luke (Jordan Poole) like lab rats. Luke gets put on a steady diet of highbrow art. When upset, he is asked to sing his feelings out. His science-leaning genes get completely disregarded. Maya (Megan O’Kelly), despite not being the offspring of intellectuals, is asked to engage with everything from a brainy, rational lens and is fed foods with high iron value to enhance her cognitive development. Maurice (Anton Gillis-Adelman), on the other hand, is encouraged to channel his violent leanings (which he inherited from his biological parents) towards peaceful harmony. But would the 12-year-long experiment to nurture an accomplished artist, a brainy intellectual and a peace-loving pacifist ultimately work? Don’t expect “Birthmarked” to resolve into an earth-shattering conclusion. It’s not likely to challenge your balanced views on the topic of “nurture” vs. “nature” when the kids act up in benign ways and get into trouble for listening to Iron Maiden. But for what it’s worth, Hoss-Desmarais’ film does provide some quirky laughs along the way, accompanied by Fionnula Flanagan’s fairy-tale-esque voiceover narration. It’s a highly fanciful package that might fool you into thinking that you’re in whimsical Wes Anderson territory where kids revolt and teach their elders a lesson they won’t forget. Unfortunately, the film’s appeal doesn’t extend that far beyond its shiny surface. Always a compelling screen presence, Toni Collette delivers upon her character’s inner ethical dilemma. The increasingly mad-eyed Matthew Goode and Michael Smiley in the (overwrought) role of the power-hungry Gertz also offer some witty delights. But “Birthmarked” ultimately falls short of bringing the emotion home. As viewers, we always find ourselves on the outside, desperately trying to break into the minds of the kids. Somehow, the film doesn’t allow us to get to know them, save for during a segment when their scholarly aunt comes for a visit to observe the young ones. It’s no surprise that “Birthmarked” finds new life when we finally hang out with Luke, Maya and Maurice while they act like the sweet kids they are. To the film’s defense, their parents don’t quite interact with the kids’ real selves either—so as viewers, we are at least not alone. Our experience surely carries echoes of how the children are treated in a lab-like, appallingly strict environment where certain types of music are banned and books are burned; where they’re conditioned to hide their urges under taught and prescribed behavior. 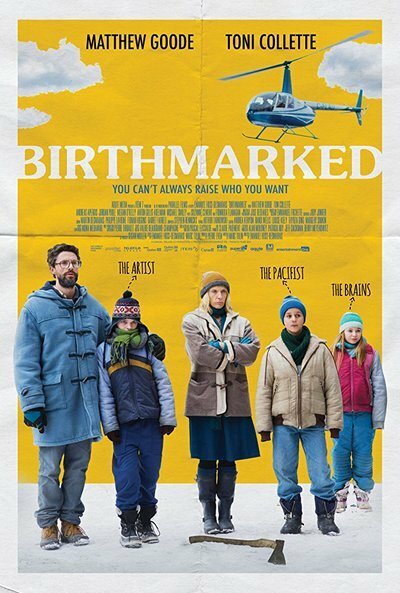 “Birthmarked” eventually makes a vague point about conservative parenting and unravels a less-than-satisfying twist. But it never quite swells your heart like a film on familial love and bonding should.